Okay, I really don't know why it took me so long to read this after I bought it in January. 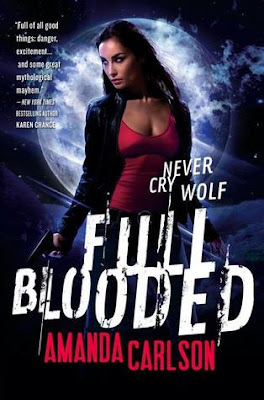 Full Blooded just reaffirms my love for shifter novels. Jessica is the only female born to a werewolf so of course something out of the ordinary has to happen to her. The story starts off with the unthinkable. She turns into a full blooded werewolf. She's a force to be reckoned with and hasn't a clue as how she's done certain things. Strong female character. The way the book ends makes you want to read the next one immediately. Can't wait to read the rest of the series. Hopefully Carlson won't cut the series short like other have that I've enjoyed in the past.